Lucinda Williams, Woody Guthrie and John Prine were cited during this show, but Alynda Lee Segarra is well equipped to ply her own route in the contemporary roots scene. The entity of Hurray for the Riff Raff forms a rooted base for Alynda to spill out the wares of her wandering spirit which blossoms into a haze of groovy soulful folk songs. 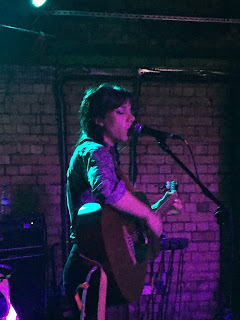 This Birmingham show was the second date of a UK tour designed to re-acquaint a British audience with Hurray for the Riff Raff and it is all systems go for the new album to hit the markets as we head into the winter months. From the moment Alynda and her four band companions struck the first note of ‘End of the Line’, an appreciative gathering at the Rainbow were left in awe of the talents in their midst. It was fitting that the band slipped in a cover of Lucinda’s ‘People Talkin’ in the latter stages of their set as the similarities in Alynda’s approach to song delivery was stark and not just as a result of the shared Louisiana connection. Over the course of a handful of original albums that Hurray for the Riff Raff have released, the stellar song structure has been a common theme culminating in SMALL TOWN HEROES being one of 2014’s most acclaimed releases in respected roots and Americana circles. Several sensational numbers from this record formed the heart of this show led by the classic duo of ‘Blue Ridge Mountain’ and ‘Crash on the Highway’ which open the album. If you thought it couldn’t get any better, the strong emotive version of ‘St. Roch Blues’ , which saw Alynda ditch the guitar to pour extra into the vocals, could only be hailed as an exceptional show closer. Not to be outdone in the troubadour stakes, the solo acoustic delivery of ‘Small Town Heroes’ in the first encore slot revealed a folk singer to reckon with and the ability to hold an audience from opening line to last. For this tour the band behind Alynda comprised of bass and lead guitars, drums and keys with all four players executing their parts of the mix with acute precision. The comfort of ease in filtering in the styles of soul, blues and rock into the sound was admirable. Essentially the core is a bunch of heart influenced folk songs given a musical coating, sung by a vocalist adept at penetrating and extracting the soul of each number. The new compositions were given an enticing preview and definitely you should look out for ‘Life to Save’, ‘Nothing’s Gonna Change That Girl’ and ‘Living in the City’. The latter possessed the evening’s most profound rock vibes and was born out of Alynda’s desire to give some insight into her New York upbringing. This sheds an alternative light on an artist who cut the early stages of a music calling via the transient life. Throw in Alynda’s Puerto Rican heritage, which at times does give the Hurray for the Riff Raff sound a Hispanic tone, add the southern exposure to the raw talent and the result is knockout music refusing to abide by the constraints of the ceiling. This was a performance that moved up the gears right from the second song ‘Ode to John and Yoko’, got everybody moving in their own subtle ways to ‘Look Out Mama’ and ended far too soon with the rousing finale of ‘Little Black Star’. Hurray for the Riff Raff will be at the forefront of the contemporary American roots scene for a long time to come and have the potential to develop further. The perfect marriage of talent, understanding, influence and heritage give the band a sure footing, with Alynda destined to flourish as a song writing performer. Birmingham Promoters should be commended for bringing them to Britain’s Second City and the promise to return soon armed with the new record needs to be grabbed.